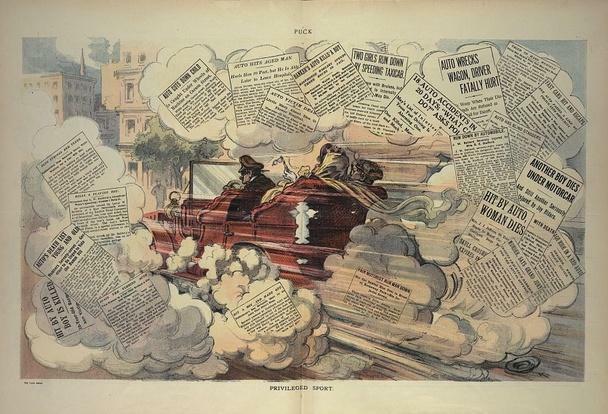 But powerful forces behind automobiles (which called themselves "Motordom") created a shift in public consciousness through some crafty public relations. "Don’t blame cars, blame human recklessness." As Mars notes, "this subtle shift allowed for streets to be re-imagined as a place where cars belonged, and where people didn’t." So this is where the term "Jay Walking" went from being applied to a country bumpkin to being "rebranded it as a legal term to mean someone who crossed the street at the wrong place or time". We are now looking at this from the opposite end. Advocates are attempting to kick the car off its pedestal. The two pronged tactic involves changing mindsets on the one hand, and changing the infrastructure on the other. Streetsblog has been working long to change mindsets with their regular online feature Weekly Carnage which shines a light on car crashes and traffic deaths/injuries. Inevitably very few drivers are changed. Transportation Alternatives of NYC also has an ongoing "Vision Zero NYC" campaign that wants the simple goals of zero deaths, zero injuries, zero fear of traffic. Like Motordom's PR campaign to blame the victim, the Vision Zero campaign is most powerful in changing peoples' mindsets. And in many cities, including Toronto, there are memorial rides whenever a cyclist is killed by a motorist. The mindset isn't enough. Just as Motordom successfully rebuilt our cities around the automobile, now nothing less than a major restructuring is necessary to take back some space. That includes proper cycling infrastructure, better sidewalks and calmed streets so kids can once again go play in the middle of them. What I'd like as a start is the roads in High Park, and others, closed to all private vehicles. I mean, it's a PARK. Leave some parking at the edge, for a decade... but what purpose does it serve to let people drive from Bloor to Lake Shore or to Parkside through the park? Slower than going around the park for the driver, but causes just enough traffic to sully the park. I remember actually playing on the streets in my old neighbourhood. Baseball, football, hide-n-seek, tag, etc. I even rode my bicycle in the opposite directions on one-way streets. Now, actually off-street play areas have to be created, and supervised of course.